Use DCC Controlled Turnouts and Eliminate Control Panels! Call me a gadget hound, but this is one of my big attractions to DCC — you don’t need any control panels! Or at least not as many. Wiring is the second most time consuming aspect of building a model railroad. How do you know what the address is for a turnout? You could put a track diagram on the facia with address numbers. You could also put numbers on the track facing up. I have seen this done by a DC layout where they didn’t want to build an elaborate control panel. It worked much better and was much less obtrusive than you would initially think. If you have between-the-rail magnets, this idea will probably appeal to you almost immediately. My H&X is being built without a panel and will locate the numbers between the rails as well as try out other ideas. 2. 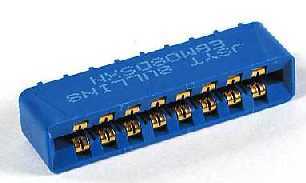 Use Digitrax’s DS-54, DS-44, or any other DCC-operated turnout module. In most cases, you may use any turnout module regardless of who made your command system — in short, you can mix turnout control modules just as you do locomotive decoders. In a few situations, like using the Digitrax DS-54, there are certain features that can only be used if the module is used with a Digitrax system. There may be situations where you want turnouts to be both controlled by DCC commands and by push buttons. I have eleven such turnouts on my layout. I want the dispatcher to be able to operate them and I want the local yard crew to be able to operate them. It may be inconvenient for the local yard crew to have to keep entering turnout addresses. So the turnouts that connect the mainline with the yard are operated by push buttons in addition to DCC commands over the network. How are some of the ways to accomplish this. INFORMATION : Turnout Controllers: With Feedback or Without. This section is strictly for those wishing to consider DCC methods of turnout feedback. If you are going to have a control panel with LED’s, you need not read this section. You can wire it the same way you always have — which is completely independent of DCC — and why it is not covered here. Attention Modular Clubs: DCC Controlled Panels Are Especially Well Suited to You! You want to operate your module but don’t want to deal with the massive problem of interconnection to a master panel? You have modules that can be turned either way. Where do you put a control panel? Consider DCC controlled turnouts. Instantly, you have no problem! No extra wires or interconnects between modules. One turnout controller can control four turnouts. Using 4-Wire Handset Jacks with Your Switch Machines. The Digitrax DS-54 uses these. The easiest way to use the phone cords is to simply not cut them in half and try to attach to the delicate wires inside the cord. Buy a 4-wire handset jack that has wires attached to it and plug the other end into the switch machine. It couldn’t be easier! Of course, do cut it to the length you need and then put a connector on the other end. 2) Use the crimper’s easy stripper. Be very sure that you insert the cable into the connector so that both ends turn out the same. For example, when I hold a connector with the tab up, I see a left most wire is yellow. Yours may be different. Now when you go to insert the cut end into the new connector, hold the tab up and make sure the yellow wire is on your left. Some cables have a ridge on one side. Don’t use this as a guide! You will find to get the yellow wire on the left side, you will have to flip the cable over. If you are questioning your sanity and mine at this point, that’s okay — I gave it a lot of thought, too, before deciding it was indeed the right thing to do. Prices are in US dollars the last time I bought them. They give discounts for quantity buys. In most cases you can buy 1 of something. However, the unit price will be higher than what I paid for the quantity I bought. USE MY PRICE INFORMATION ONLY AS A GUIDE. I DON’T INTEND TO CHECK FOR PRICE INCREASES. Using the 4-wire jacks from Digikey, the colored pigtails correspond to Digitrax’s ordering. No, Digitrax and Digikey are not related! Just solder the pigtail ends to your favorite switch machine. 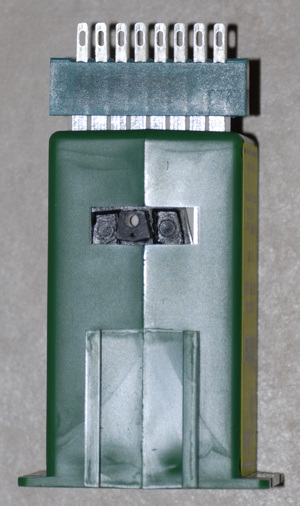 Using an adhesive like Liquid Nails or Walther’s Goo to glue the 4-pin telephone handset jack to the side of the switch machine or bracket. This will give you a convienent to use assembly. Adjust turnout motor direction so that the polarity of the reversing track loop and throwbar position agree. The Digitrax DS54 (obsolete) and DS64 use a positive common, rather than the more conventional negative common, for its input signals. If you are using their product with switches, just wire as shown in their manuals. 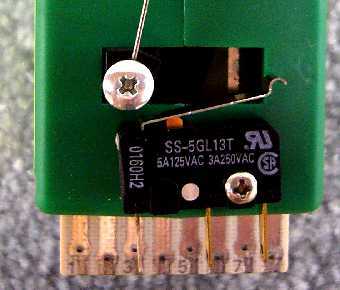 If you want to use an optical sensor, such as that made by Don Vollrath DVollrath@magnetek.com, long time contributor to the Wiring For DCC Q&A Forum, you will need to tie the sensor’s power supply lead, as well as your +12V source to the DS64 (DS54) +Common connection. If you think about it, it is just like you would hook up a negative common. Note that the ground or negative lead of your power source only goes to the sensor’s negative or common lead. If you have multiple sensors to use with the stationary decoder, you may. 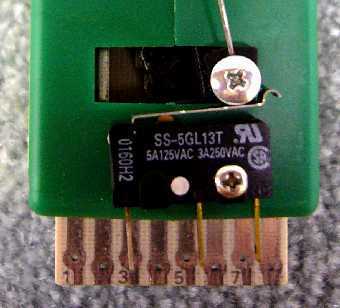 Just hook additional sensors’ supply and ground connections to the power supply shown here as a “wallwart” (wall-mounted plug-in power supply). SUGGESTION : Use Slow Motion Switch Machines. I generally have a difficult time getting the old under the table twin coil type switch machines to operate my turnout properly. I just can’t seem to get those linkages set right. I find the slow motion switch machines are almost effortless to install. The Tortoise switch machine motors push the track switch throw-bar in one direction then ‘stall out’. You can remove power and the motor will usually stay in place. There is no harm in leaving it energized as long as the voltage across the motor is 12V or less. At 12V, about 10 ma of current will flow. The electrical connections must be able to reverse the voltage & current to the motor in order to throw the switch the other way. There is one catch to using your DCC track power to operate your turnouts. If a short develops as a result of the slo-mo motor’s operation, everything will stop and you will not be able to get it going again. If you want to operate your slo-mo motors from DCC, consider using a dedicated booster for that purpose. Since the DS-54 is very flexible and this is the only way I use mine, I do not offer advice on other ways to program it. Note: Even if you don’t need to use yours like I do mine, you may want to program it like mine if you are having trouble. Sw. Message Type 42 44 46 48 02 Send turnout feedback message. Follow this sequence to program the above CV’s in your DS-54. 5. REMOVE PROGRAMMING RESISTOR. Do this if you don’t want to see smoke! I don’t advocate the use of phone cable when the Switchmaster or Torquemaster motor and Rix Rax II bracket is used with a Digitrax DS-44 or the CVP AD4 accessory decoder because what I am about to tell you is so simple. NCE and no doubt, others have or are coming out with simple, low cost turnout controllers. The following discussion probably covers everything that is or will be available as they will no doubt fall into one of the three categories below. None of these types provide feedback. Use something like the Digitrax DS-54 if you need feedback. The NCE isn’t as inexpensive as the Digitrax unit, but it’s not too much more (per turnout), and best of all, already comes with screw terminals to connect to your layout wiring. It won’t be as compact controlling a lot of turnouts as I describe for the DS-44 below, but it’s all ready to go and worth serious thought. If your time is valuable and a few more dollars per turnout doesn’t bother you, than a turnout controller like this one is the way to go. If you have a lot of turnouts to control and space is tight, then consider the Digitrax DS-44. The Digitrax DS-44 is the lowest cost per turnout, but is not designed to be used under a layout. I find that mounting it to a circuit board and small screw terminals that solder to the circuit board increase its robustness – the wiring is very frail for under layouts. Use some Walthers’ Goo to glue the decoder to the circuit board on top of the current limiting resistors if you install them on this circuit board. You can get three of the DS-44’s on one terminal strip and will give you compact control of 12 turnouts. See the Radio Shack parts listed in the Getting Electronic Parts section. The CVP AD4 requires the installation of two jumpers – since you are not using the high power option. Take one of the resistors and install it as one of the jumpers; say the odd numbered ones like J1, J3, J5, and J7. Install jumpers in the even positions J2, J4, J6, and J8. Now all you need to do is run two wires from the AD4 to the motor. 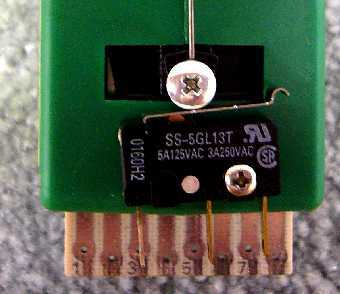 R1, R2, and the telephone jack, shown above for the Digitrax DS-54, are not needed. It can’t get any simpler than this! Add the frog power routing microswitch and the second microswitch for control panel LED’s if you are going to have them. While any mobile or stationary decoder should work with any DCC system, I have had reliable operation difficulties with the CVP AD4 on my Digitrax equipment. Sometimes it works, sometimes it doesn’t. CVP has an excellent reputation and popularity. I’m sure the problem is the mix of equipment I have. If you are going to mix decoders with different DCC systems, it is probably wise to buy only one or two at first and make sure you get the reliable operation you want. Tony’s Train Exchange has a great comparison that is more complete and timely than I can keep up with as part of huge website. Be sure to check out this GREAT comparison on stationary decoders! Note: Tony has a lot of other great information and comparisons. Be sure to check out his web site. Also, check out the manufacturer’s themselves as well as those companies that are listed on the manufacturer’s page that are sellers or maintaining websites for manufacturers. These are shown in bold. 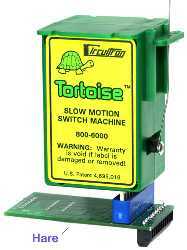 SUGGESTION : Using Tortoise Switch Machines. 3. If you are DCC controlling your turnouts, the DCC power operating your turnout stationary decoders should be on its own booster. Lastly, they are also much more difficult to mount than the Rix Rax II bracket above when used with a Switchmaster or Torquemaster motor. Therefore, if you want to use Tortoise switch machines I suggest you use DCC friendly turnouts and you may want to avoid power routing the frog. By not power routing the frog, you eliminate the concern about shorting the DCC power or the switch contacts burning up from damaging short circuit currents over time. DCC friendly turnouts have the point, closure, and frog rails already wired to the appropriate stock rail. Therefore you will not have long term trouble getting power from the points as you would with non-DCC friendly turnouts. By using a DCC friendly turnout without power routing the frog, you will have a dead frog. If you have any locomotives that will stall on a dead frog, you should not consider the use of Tortoise switch machines. You can minimize your stalling possibilities by using turnouts with the smallest possible dead frog. Also, if your locomotive is not all wheel pick-up, making it so will decrease the likelihood that it will stall on a dead frog. If you have an existing layout using power routing turnouts that you are not going to convert to DCC friendly (see the section on Wiring turnouts on why you should use DCC friendly switches), you should not consider using Tortoise switch machines. Shinohara and Micro Engineering are examples of turnouts that do use power routing points and are not DCC friendly. Pilz, Atlas, Roco, Peco makes turnouts that isolated frogs. Some may require jumpers appropriately placed on the back of the switch or manufacturer installed jumpers cut before installation. See the section on Wiring turnouts. SUGGESTION: Controlling a Tortoise – A Decoder Made Just For It! The manual is pretty clear and succinct. It doesn’t leave you confused and full of questions. You can download yourself a copy from the DCC Specialties website. It’s worth doing especially if you are contemplating using auto throw, auto reversing and auto entry into a reverse loop. The manual covers these possibilities in detail. If the manual is so good, what is left for me to say? Well, some of you (okay, all of you!) may not want to take the time to read the 16 pages that constitutes the manual. So I’ll help you focus on the things that will allow you to implement your Hare without reading the whole manual. I’ll also describe some of the features that you might find particularly interesting and note some things you need to know to use those features. First, let me say that while the Hare is loaded with features, you don’t have to read the whole manual before you start. Only nerdy engineers like myself read manuals in their entirety! The Hare will work immediately on turnout address #1. If all you want is control a turnout and power route the frog, this is easily accomplished and you can be up and running in literally just a few minutes. Generally, you can implement the use of other features later as you need them. Before we get started, a word about toothpicks. The Hare manual recommends the use of toothpicks to assist in centering up the connector on the Tortoise. I know this seems hoky. Okay, it is hoky. The problem isn’t with the Hare. The Hare is using an industry standard connector. If the Tortoise had a connector that was industry standard, the Tortoise might have to be made wider. You probably don’t want that. So just use your toothpicks. 2. Program CV49, if necessary, to indicate to the Hare which position of the turnout is the “clear” position. You program switch addresses by using your DCC system to issue turnout control commands. To use the Hare’s advanced features, you will also have to program a few CVs. These are programmed in OPS mode. At no time do you use your DCC system’s “programming track” or other programming modes. As the Hare manual indicates, you cannot read back CVs in OPS mode. So I suggest you keep a log of what you program into your Hares. Also, since the Hare is not a locomotive, you cannot select it like a locomotive. If you are familiar with OPS mode programming, you need to select a locomotive. So what do you do? You select a locomotive you do not have on your model railroad like 9997. The Hare, when in OPS programming mode, will simply accept OPS mode commands. How do you select which Hare receives OPS mode commands if a Hare will accept any OPS mode command? This is accomplished by using a programming mode jumper on the Hare. When you program the Hare’s base turnout address, just put the Hare in programming mode and send it a turnout address with your DCC system. If you want to use route capability, then send it up to 13 more turnout commands. More on route programming coming up. 3. Subsequent turnout addresses will load the Hare’s route list. See CV63 for programming the base address and route addresses out of sequence. Note! Read the “Special Programming Instructions” in the Hare manual for your system. Otherwise, you may get unwanted results. If you will be powering your Hare from the same booster as the track above it, then you can use the simple wire frog powering hook-up. If you plan to use auto throw (and auto return), you have no choice but to use the simple wire hook-up. If you try to use your Hare with a different booster and you try to use auto throw, you could blow your booster’s output(s). If you have a good size layout like me, you may be using a separate booster to operate your turnouts. This has the advantage of operating turnouts that tend to short briefly as the turnout changes position. With a separate booster, the turnout keeps moving and thereby clears the short. If you wired your layout this way, you can use the Hare to power route your frog from the local track bus and corresponding booster. There is one catch. If you use a separate booster to power your Hare, you will not be able to use the Hare’s auto throw feature. 1. Connect your frog to the Hare’s J1-5 (connector J1, terminal 5). 1. Connect your frog rails to the Hare’s J1-3 and J1-4. 4. You don’t have to put the insulated joiners where shown. I put them there to remind you that if you are using auto throw, you will have put them somewhere to isolate the trigger rails from the rest of your layout. Note: If you are not using auto throw, you don’t have to make the connections to J1-4 and J1-3 and you would don’t need the insulated joiners, either. 5. See the explanation for the Peco Insulfrog for the items above marked “option 1” and “option 2”. I don’t know how many of you are using separate boosters to power your turnout controllers, so I’ll just briefly describe what you need to do. If there is interest, let me know and I will provide a diagram. All you have to do it is set all of the Hare’s option switches (S1) to OFF to use the Tortoise’s contacts. J5 on the Hare provides the Tortoise’s contacts for use in power routing. You can buy screw terminal contacts from DCC Specialties or Digikey. (p/n ED1520-ND). Radio Shack sells solder in screw terminals but they are spaced a little differently and therefore, do not work with the Hare. The trigger rail must be located two seconds away from points. For a passenger train or a fast freight, this is about two feet away from the points. For a coal drag, six inches will do it. If operating passenger trains and coal drags on the same layout, you have some decisions to make. You might have to make your sidings up to four feet longer than your coal drags. Or you might decided that your passenger trains will never take the siding at track speed thereby allowing you to have your trigger rails located closer to your turnouts. The manual also covers a way to extend auto throw trigger rails in limited space. One thing the manual doesn’t talk about is what to do when you are using a locomotive that has limited power pick-up. I have Mantua locomotives that do the power pick-up on one side of the engine and the tender picks up from the other rail. I also have some Rivarossi articulateds that pick-up on one side of the lead articulated engine and the rear articulated engine picks up from the other side. In both cases, half the locomotive and tender may be across your trigger rail before the Hare knows its there. The Hare may just be your incentive to improve the power pick-up on these locomotives. In the mean time, it is something you must think about. You may have to locate your trigger rail six more inches away than if your locomotive had all-wheel power pick-up. I am using JMRI for my control panel and thought it would be great if the Hare offered a soft(ware) dispatcher lock. You may see this in the next release of the Hare and will allow a simple turnout command for JMRI or a dispatcher’s throttle that will lock main line turnouts in a particular direction. The advertising for the Hare says that the Hare V2 can provide feedback to the Digitrax Loconet, the NCE Cab Bus or the Lens XpressNet. It does not connect to any of these buses directly. The Hare V2 provide optically isolated outputs that provides position feedback outputs. These must be connected to devices that can report position to your favorite bus – DS54, DS64, or Team Digital SRC8 for Digitrax, LR101 for Lenz, or AIU-01 for NCE. If you are using a computer control system that has digital I/O cards, the optically isolated outputs of the Hare V2 can be connected to the inputs on the DIO cards. It should be noted that if any other system should enter the market with position feedback capability, the Hare V2 would likely be able to easily interface to it. See below for mating the Hare to the Tortise. Place one large drop of polyurethane “Gorilla” glue under the snap switch and mount with a 2-56 x 3/8 screw. Adjust the angle of the switch so that it clicks ON/OFF as the Tortoise movement traverses through the center of travel. If you immediately mount the unit onto the layout, you have several hours to adjust the snap switch to ‘click’ just as the throwbar of the turnout is in mid position. Tortoise arm in left position – microswitch not made. Tortoise arm in right position – microswitch “made” or depressed. Tortoise arm in center position – microswitch just made. 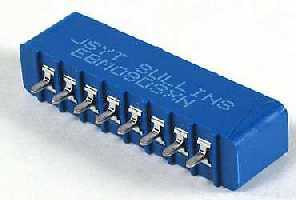 You can also buy blue 8 pin connectors from Traintek and green 8 pin connectors from Bill’s Trains and Track. These doesn’t need the outermost solder tabs bent. Both connectors are still just a little too wide for the Tortoise contacts. You will need to center up the connector on the Tortoise or you may short the contacts on the Tortoise. Or glue in a piece of toothpick or narrow pieces of styrene into the connector as above into both sides of the connector. RECOMENDATION : Using A Separate Booster for DCC Controlled Turnouts. While this is a good idea, see the section on track regarding bus feeder lengths greater than 30′. You will need to twist your bus wires between your stationary decoders. You will also need to terminate your bus ends. As a way of saving money, you could use the booster from somewhere else in the room to power your stationary decoders. Example: If the room is divided into two halves and you have two boosters, the booster that powers the track on the left half of the room could also control the stationary decoders on the right have of the room. And of course, the booster that powers the track on the right half, could control the stationary decoders on the left half. This could get confusing; use this economy measure only if you can’t afford a separate booster to control your turnout stationary decoders.